Download "SOUTHEAST MISSOURI STATE UNIVERSITY"
1 COURSE SYLLABUS SOUTHEAST MISSOURI STATE UNIVERSITY Department: Elementary, Early, and Special Education Course No. CE 614 Course: Family / School Partnerships in Early Childhood Revised: Spring 2012 and Elementary Education The Teacher as Competent Professional Educator I. 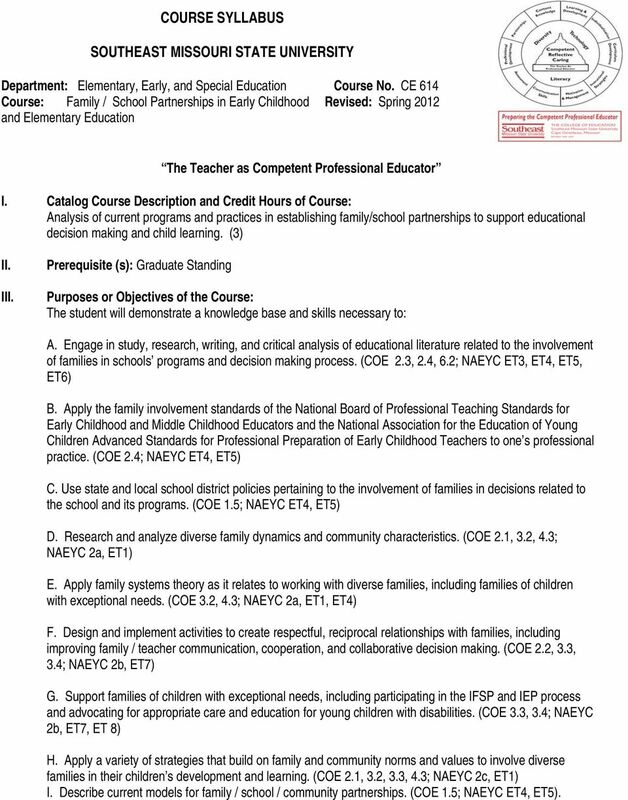 Catalog Course Description and Credit Hours of Course: Analysis of current programs and practices in establishing family/school partnerships to support educational decision making and child learning. (3) II. III. Prerequisite (s): Graduate Standing Purposes or Objectives of the Course: The student will demonstrate a knowledge base and skills necessary to: A. Engage in study, research, writing, and critical analysis of educational literature related to the involvement of families in schools programs and decision making process. (COE 2.3, 2.4, 6.2; NAEYC ET3, ET4,, ET6) B. 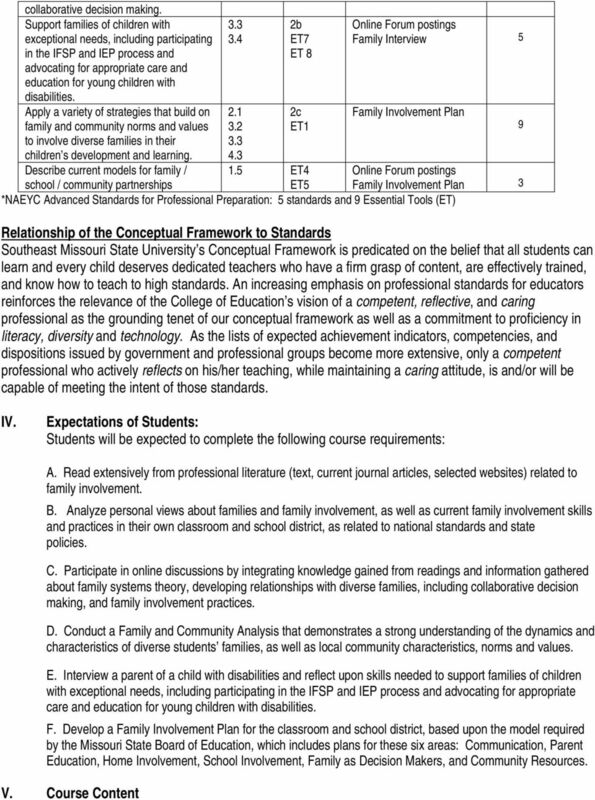 Apply the family involvement standards of the National Board of Professional Teaching Standards for Early Childhood and Middle Childhood Educators and the National Association for the Education of Young Children Advanced Standards for Professional Preparation of Early Childhood Teachers to one s professional practice. 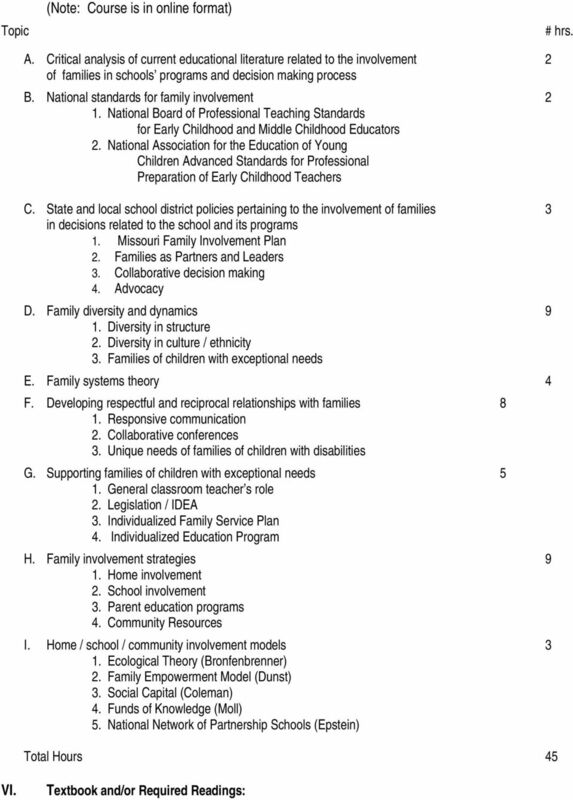 (COE 2.4; NAEYC ET4, ) C. Use state and local school district policies pertaining to the involvement of families in decisions related to the school and its programs. (COE 1.5; NAEYC ET4, ) D. Research and analyze diverse family dynamics and community characteristics. (COE 2.1, 3.2, 4.3; NAEYC 2a, ET1) E. Apply family systems theory as it relates to working with diverse families, including families of children with exceptional needs. (COE 3.2, 4.3; NAEYC 2a, ET1, ET4) F. Design and implement activities to create respectful, reciprocal relationships with families, including improving family / teacher communication, cooperation, and collaborative decision making. 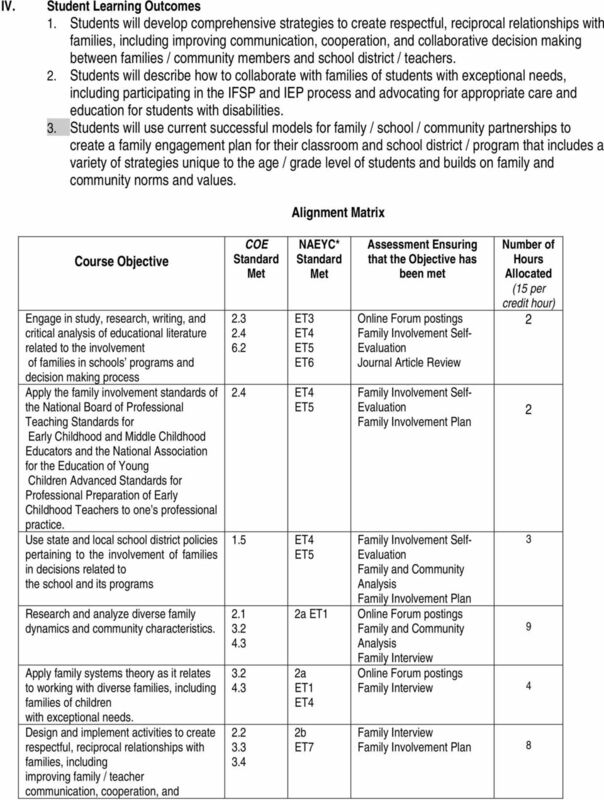 (COE 2.2, 3.3, 3.4; NAEYC 2b, ET7) G. Support families of children with exceptional needs, including participating in the IFSP and IEP process and advocating for appropriate care and education for young children with disabilities. (COE 3.3, 3.4; NAEYC 2b, ET7, ET 8) H. Apply a variety of strategies that build on family and community norms and values to involve diverse families in their children s development and learning. (COE 2.1, 3.2, 3.3, 4.3; NAEYC 2c, ET1) I. Describe current models for family / school / community partnerships. (COE 1.5; NAEYC ET4, ). Together We Shape the Future through Excellence in Teaching, Scholarship, and Leadership. 1. Course Prefix and Number: PET 6256 Credit Hours: 3. 3. Regular Instructor(s): Robert Mertzman PED 215 Robertm@tempest.coedu.usf. I. INTRODUCTION A. An introduction to the profession of early childhood education, focusing on developmentally appropriate practices, types of programs, historical perspectives, ethics, and current issues. 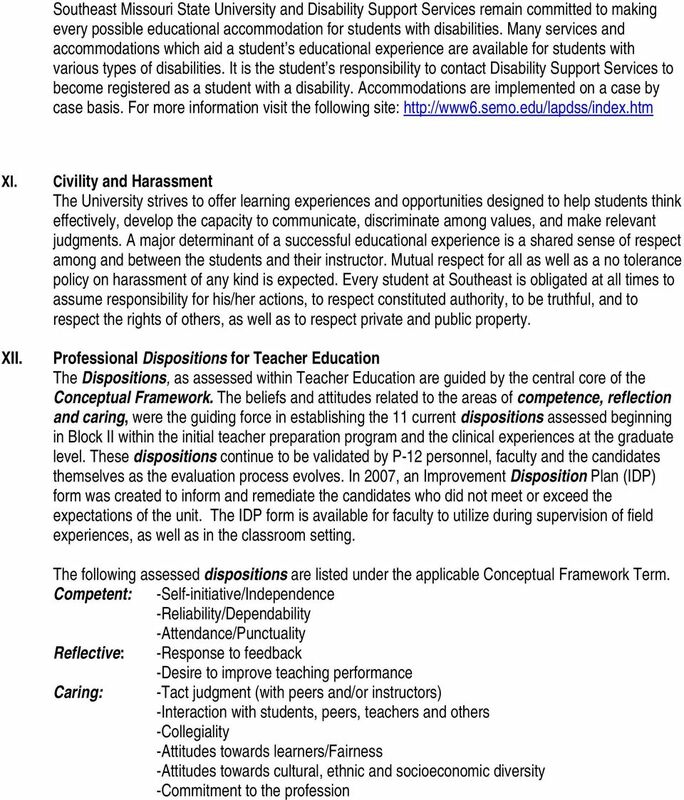 Prerequisites: Admission to the special education diploma program. C. This course is occupationally related and serves as preparation for careers in Child Development. Monfort College of Business Semester Course Syllabus (2015-2016) COURSE PREFIX/TITLE: BAMG 354 Organizational Behavior Sem. Hrs. 3 Ed. 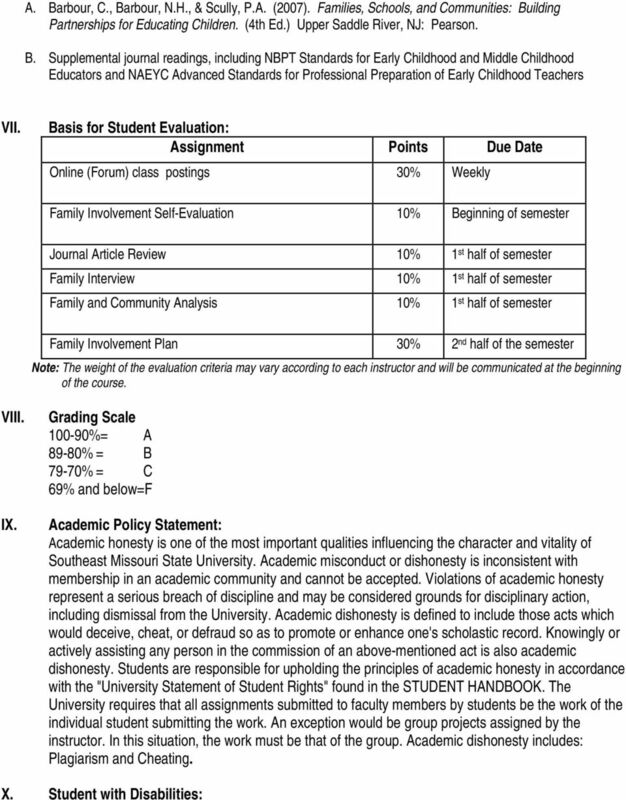 Program Status Report 1 FLORIDA INTERNATIONAL UNIVERSIT COLLEGE OF EDUCATION Program Folio Status Report Program:_MS in Education Degree Level:_Master s Program Leader: Dr. Joyce C. Fine Program Faculty:_Dr.